Our days are filled with constant activities that demand our attention and prematurely deplete our energy levels. Lives are busier, demands are higher, and the continuous need for energy becomes increasingly important each day. Far too often, people are forced to choose between unhealthy energy drinks to supplement their depleting energy levels. Such choices provide little to no nutritional value and consequently load the body with unnecessary amounts of sugar and artificial caffeine. The use of these unhealthy alternatives often results in the ‘sudden crash’. e9 delivers energy derived naturally from healthy sources. L-arginine together with a potent blend of amino acids, pure caffeine from guarana and other herbal extracts, and a unique combination of B vitamins will lift you out of an energy-deficient slump and give your body the added nutrition it needs to boost and sustain energy levels. e9’s exclusive high energy, low calorie formulation provides steady energy for hours then lets your energy gradually subside without experiencing that typical sudden crash. 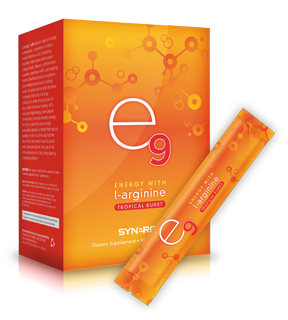 Anytime during the day when you need to be focused, alert, and energized, mix up an e9 and experience its fast, long-lasting energizing effect. Enjoy the tasty Tropical Burst flavor and you’ll soon be energized for hours.